The Settings Menu provides access to the Advanced Mode. Select Settings > Advanced Mode to display the login dialog. Once the login is validated, additional settings can be set by an authorized personnel. In addition to accessing the Advanced Mode, the Settings Menu also provides access to many options. These options are shown as active or unavailable (grayed out). Menu items that are active and have a check mark indicate that the Production specialist can control these settings. Menu options that are unavailable and have a check mark indicate that these options have been set in the Advanced Mode, but that the production specialist cannot control these settings. Menu items that are active and do not have a check mark indicate that authorized personnel can access them. Menu options that are not enabled for the Production Mode are shown as grayed menu items. The figure below shows the Settings Menu Options in the Advanced Mode. Because we're now in Advanced Mode, the Advanced Mode under Settings is now grayed out (see red box in the figure below). Noticed the Release from Reset is also grayed out meaning we can click Hold in Reset to enable the prevention from running the code after programming. Detailed descriptions of each menu settings will be described shortly. In the above figure, you'll notice that many settings are also grayed out. This is because the MPLAB® IPE is now in the Production Mode. The only options you can now choose are the Advanced Mode, Hold in Reset, and Release from Reset (Depending on which one was previously chosen). See figure below. The table below describes each Settings Menu Options. Advanced Mode This option opens the Advanced Mode login dialog. Refer to Setting Up the Programmer and Advanced Mode Options for more information. Verify Device ID Before Program This option is only appropriate when using devices that have device IDs. Erase All Before Program This option is used to control whether or not the contents of the device will be erased before it is programmed. It is not applicable to One-Time-Programmable (OTP). When the “Erase All Before Program” option is enabled (i.e. the check box is checked), the device will be erased before it is programmed. If it is disabled (unchecked), the device will not be erased before it is programmed. 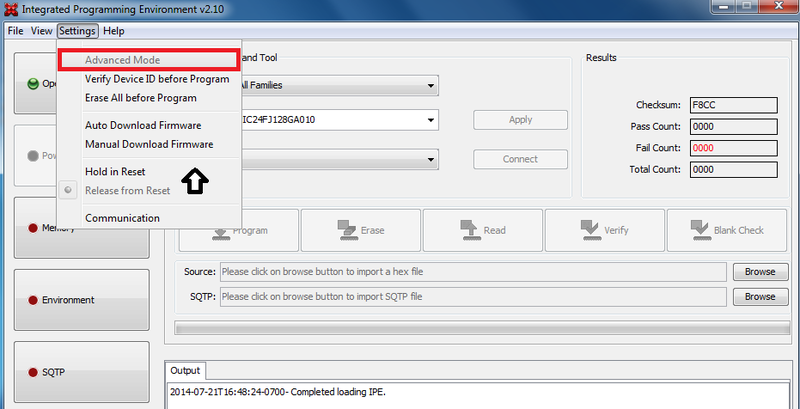 Auto Download Firmware If this option is selected, the application verifies the firmware is the latest available; and, if needed, downloads the newer firmware automatically. Manual Download Firmware This option enables manual download of firmware. Hold in Reset This option prevents the code from running after programming. 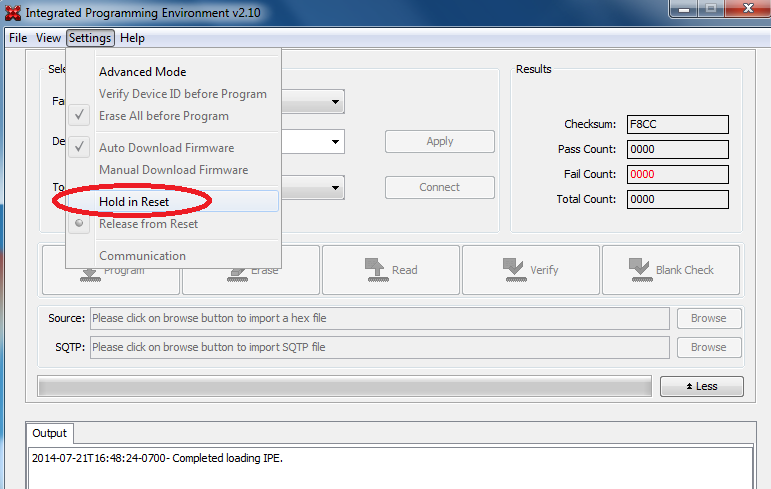 Release from Reset This option releases Reset and allows the code to run. Communication This option enables communication to be set for COM or USB ports. The firmware download will not occur until the connect/disconnect button is clicked or a programming operation is performed. 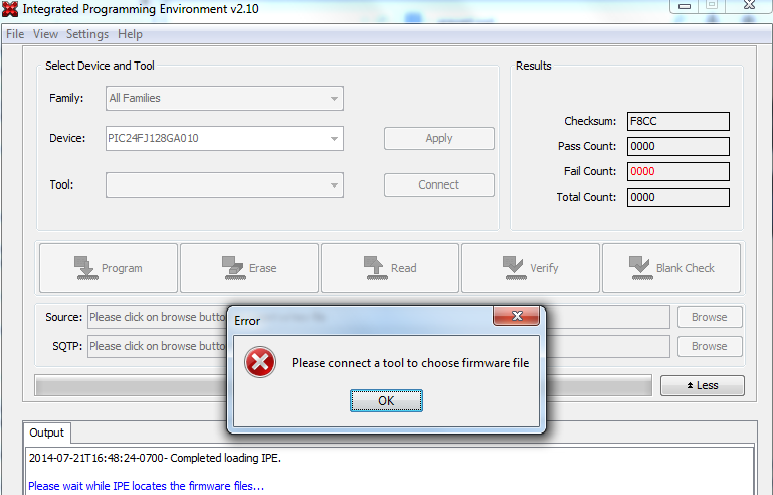 If you click Manual Download Firmware, but the tool wasn't connected, the "Please connect a tool to choose firmware file" message will appear, as shown below.